An exceptionally talented hockey player, Hannah MacLeod was inspired at the age of eight by the performances of Linford Christie and Sally Gunnell at the 1992 Olympic Games. Hannah began her youth hockey career at St Ives Hockey Club, Cambridge, and rose up the ranks to play for their first team. She went on to play club hockey for St Albans, Leicester and Loughborough students. Her first international appearance for England was at the age of just 19 in 2004. Now, 12 years on, Hannah has over 150 caps under her belt, an Olympic Gold medal from Rio 2016, and bronze from London 2012. 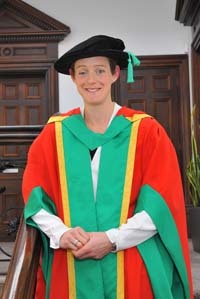 Hannah’s journey with NTU didn’t start today, as she conferred her doctorate with the University in 2009 and went on to to develop her own nutrition consultancy for athletes, businesses and schools, which she runs alongside her hockey career. The ambition and drive of Hannah’s character embodies the qualitieswe aspire for in our students and graduates today.